RUSH: There was a special election in Arizona yesterday, and the Democrats, they had already put it in the hopper as a win. They were gonna win and it was just the beginning, the next phase of this gigantic blue wave that’s gonna happen in November. Except it didn’t happen. The vote count as of this morning wasn’t final, but Republican Debbie Lesko is ahead of the Democrat Hiral Tipirneni by a five-point margin. It wasn’t supposed to happen. So here we have a CNN story, here’s the headline: “Why the Win for Republicans in Arizona 8 is Still Good for Democrats.” You see how this works? Even when the Democrats lose, they win, and it has been this way with every special election they have won this year and last. Oh, yeah, this is big for the Democrats. This ought to have the Republicans very, very nervous. What do you mean? You guys said the Democrats were gonna win this. We have been told, we have been taunted, they have told us gleefully for 12 months that no Republican will ever win another election because of Trump. The entire country, the entire country was going blue, the country’s fed up with Trump, the country hates Trump. Even Trump voters are embarrassed and wish they could take their vote back, and they will the first chance they get. But somehow a Republican woman won yesterday in a special election in Arizona, which means the Republicans hold onto the seat, Arizona 8, Debbie Lesko has now defeated this guy, I think the final margin was six points. That is wider than the polling has been in this race. Once again polling got it wrong. But here’s how they do this. They say, “Well, it was much tighter than the over 20 points by which Trump won in 2016.” So they’re doing here what they tell us we can’t do. Let me give you a comparison or an analogy. The way they’re doing this is comparing a presidential turnout to a single race, or very few races on the ballot, practically entirely local election, two completely different it turnouts, and yet the Drive-Bys here are treating them as the same. So what they want their readers to believe is that in a district that Trump won by 20 points, the Republican held on to it, but only by six, which means Trump is really losing popularity. The Republicans are really losing popularity. And this means even with this win, the Republicans know they’re in deep trouble. The Democrats lost the seat! They thought they had it in their back pocket. This is like trying to compare a midterm election turnout with a presidential year turnout. They’re different. Different energy, different issues, different types of demographics represented. Yeah, it took a big-money push from the GOP, tweets by Trump, and the support of the state’s current and former governors, but the GOP held on to Arizona 8, they would have never considered endangered in another year. So we’re supposed to sit here and say it’s weird that the president would support the candidate; it’s weird the party would support the candidate; it’s weird that the state’s current and former governors would support the candidate. That’s weird? It took a big money push from the GOP. It took tweets by Trump. And it took the support of the state’s current and former governors, but the GOP held. Isn’t that what happens in every election? For the most part. Republicans came out and supported their candidate! The candidate won! Somehow this is problem for the Republicans. They had to do this? Isn’t this the way Democrats — didn’t they think Hillary was gonna win simply by doing nothing? They thought Hillary was gonna win without Hillary campaigning. She didn’t have to go to these blue states ’cause it was in the bag. Meanwhile, Trump’s out there working it and working it, and he ends up winning the presidency. The Democrats are discombobulated and bamboozled. It’s odd that the Republicans actually campaigned? It’s odd the Republicans actually spent money on the seat? So the Republicans did. And, by the way, I thought Trump was an albatross. I thought Trump was a drag on the ticket. Why did Trump’s tweets help? 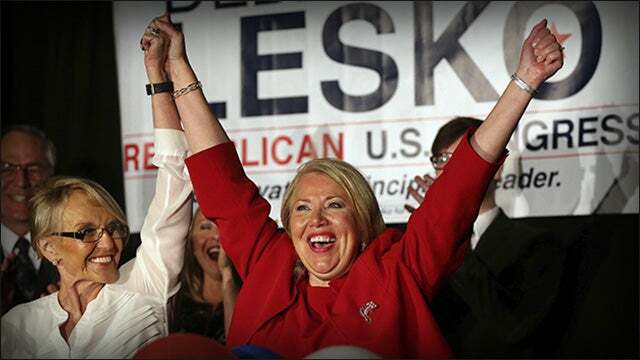 If everybody hates Trump — so goes the thinking — and if so many people want Trump gone, if so many people regret their vote for Trump, how come Trump was able to help Ms. Lesko win? RUSH: Yeah, yeah. I’m gonna give you an example of what I’m talking about here. But first in Arizona, let me tell you why the Democrat lost — and the margin of defeat for her was six points. She lost. The Democrat’s name is Hiral Tipirneni. She’s down by six. She ran as a full-fledged liberal Democrat. The Democrats are feeling it. I’ve told you they’re taking the mask off. They’re overly confident, they’ve become arrogant, and they think — because the lies they tell themselves and the disservice their lying media does reinforcing lies that they end up believing. She ran as an open liberal and got trounced. The Democrats that have won special elections have hidden it. In many cases, they sounded more conservative than their Republican opponents.